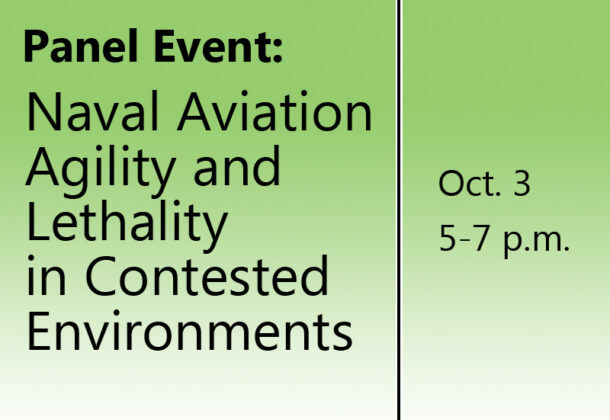 The Patuxent Partnership and the Association of Naval Aviation are hosting an educational panel event Oct. 3, 2018, titled “Naval Aviation Agility and Lethality in Contested Environments.” The event will be held from 5 to 7 pm at the Patuxent River Naval Air Museum in Lexington Park, MD. The event will begin at 5 pm with hors d’oeuvres and libations. The panel begins at 5:30 pm and ends at 7 pm. The Patuxent River Naval Air Museum’s Flight Tech Hall is the building behind newer facility at 22156 Three Notch Road. Dress for the event will be business casual or the military uniform of the day. The Patuxent Partnership, 22335 Exploration Drive, Suite 1035, Lexington Park, MD 20653. It’s also possible to register at the door for $25. Sorry, no refunds. Any proceeds after expenses will go to the Association of Naval Aviation’s Squadron 18’s scholarship fund and other STEM programs and initiatives in the Southern Maryland region. Acquisition workforce attendees can earn 2 CL points by attending the panel event.